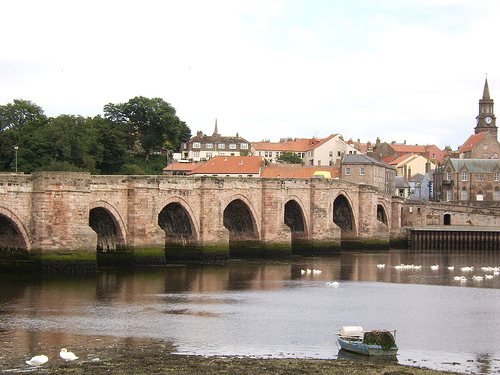 Your author mentioned the beautiful bridge which crosses the River Tweed in Berwick-upon-Tweed yesterday, it deserves a feature on its own. Built in the mid-17th century to replace the 14th century bridge which James VI of Scotland crossed on his way to begin the Stuart age and become King of England after the death of Elizabeth I. Though it is no longer the main river crossing, the 355 metre sandstone bridge and its 15 arches are protected by a Grade I listing, the latest in a succession of crossings at this point, with the earliest swept away by flooding in 1199, one destroyed by the English in 1216 and others removed variously by floods and the building of the current bridge.